Lot Detail - 1949 Bowman #226 Duke Snider Rookie Card – PSA GEM MT 10 "1 of 1!" 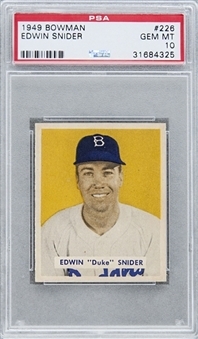 1949 Bowman #226 Duke Snider Rookie Card – PSA GEM MT 10 "1 of 1!" Graded GEM MT 10 by PSA, a "1 of 1" condition rarity on that company's Population Report. Hall of Famer, seen on his debut-year commemorative. This is the lone example at its tier among a total of nearly six hundred copies recorded in PSA’s census reporting. 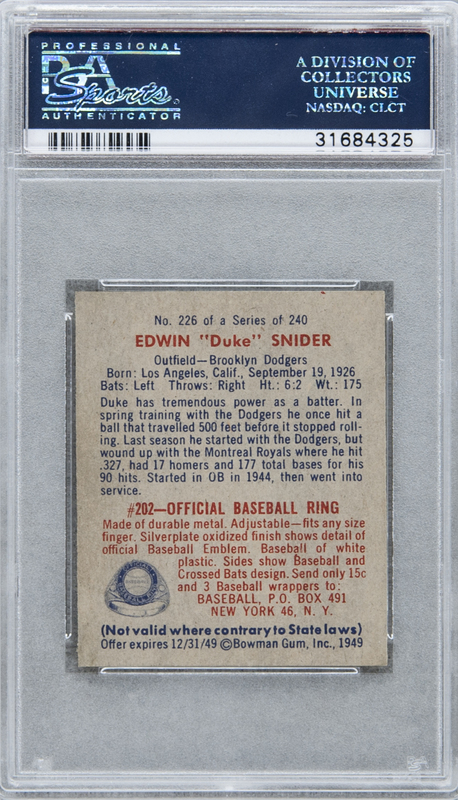 Edwin Donald Snider, much better-known to the baseball world as "Duke," joined the Brooklyn Dodgers the season prior to this superb collectible's creation. He soon came to be regarded as one of the best sluggers of his era, and was enshrined at Cooperstown in 1980. 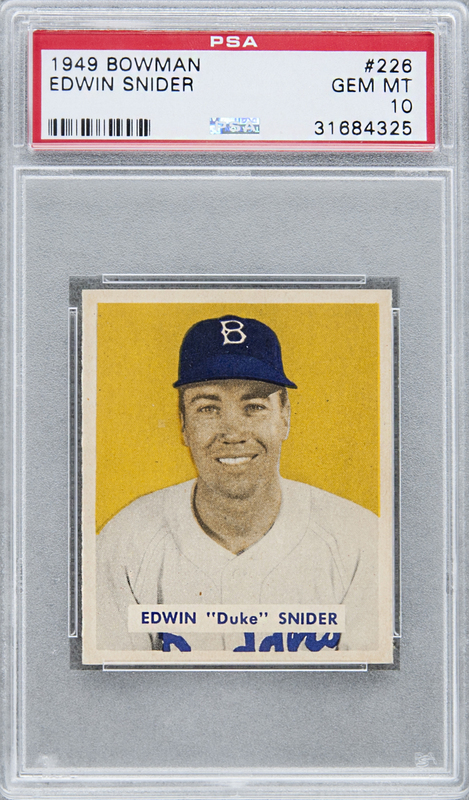 Offered is Duke's rookie card, the much-coveted entry in 1949 Bowman. Snider appears on one of the issue's scarcer "high number" depictions. His name and nickname are printed on the front; they act as a caption in this, singular instance, for a carefully tinted, perfectly inked portrait likeness. This specimen is noteworthy for its clarity and depth of color, as well as impeccable centering, and even the most intense scrutiny fails to reveal wear on its sharply pointed corners. The reverse is exceptionally clean and shows bold red-and-blue print. A key, challenging piece, in wholly praiseworthy Gem Mint condition.